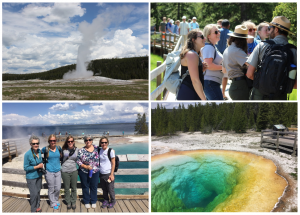 Pat Maloney, Maine PLT state coordinator, (far left, lower photo) enjoys Yellowstone tour with colleagues from the United States, Canada, Mexico, and Japan. 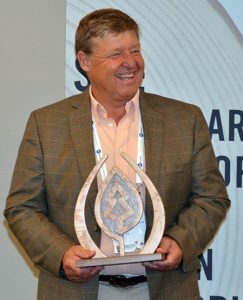 By Kathy Abusow, president and CEO of SFI Inc.
We wanted to share all the great news from the PLT International Coordinators’ Conference in Cody, Wyoming with as many of our network partners as possible. We feel that the conference was a great success and we want to share some highlights! We had a wonderful turnout with over 130 participants from the United States, Canada, Mexico, and Japan. This was PLT’s first conference as part of SFI and it was gratifying to see how well PLT, SFI, and the entire PLT Network worked together to support our combined program goals. I’d like to extend a special thanks to our hosts, Wyoming PLT! Not only did they assist with all the logistics, but they added so many special touches that helped us connect with each other and with the local community. One highlight was the Hospitality Suite – set among cabins and a wonderful outdoor space – we reflected on the day’s sessions, created and burned our own unique state brand on a wooden bench that will be added to the outdoor classroom at Sundance Elementary School, and enjoyed the music of the Red Butte Band. Also, a special thanks to the many session presenters who were drawn from the ranks of our network – the backbone of the PLT program. Over 40 individuals helped to lead our general, concurrent, and show and tell sessions. And thanks to our conference sponsors for their generous support. They include Nieman Enterprises, Arbor Day Foundation, Your True Nature, Hancock Timber Resources Group, ee360, and the Albert I. Pierce Foundation, as well as Wyoming State Forestry Division, Northern Rockies Tree School, and Laramie County Conservation District. We know how important sharing knowledge and resources is for all of us. Please use this conference proceedings link to view conference session resources from the General, Concurrent, and Show and Tell sessions. This link allows you and others to view and download files. If you would like to upload an item to this resource collection, please email the Rachel Lang (rlang [at] plt [dot] org) for assistance. We are inspired by the many ways that PLT helps you meet your personal, professional, and organizational goals. This word cloud beautifully sums up your aspirations from our visioning exercise. We are eager to help bring them to life as PLT grows it reach through our collective efforts. The Pre-Conference Session focused on the ADDIE instructional design and how it can be used to enhance our professional development. Bill Crapser, Wyoming State Forester, and Kristie Salzmann, Shoshone National Forest Public Affairs Officer welcomed us to Wyoming and shared the challenges and rewards of managing forest lands for a variety of purposes. Keynote Dan Thompson of the Wyoming Game and Fish Department shared some amazing slides and video that explored the expansion of large carnivore populations in and around Yellowstone and introduced us to the term Charismatic Megadrama! He stressed the importance of education in helping the public understand the role of large carnivores in the greater Yellowstone area. In General Sessions, we explored the many ways that PLT can strengthen its core and grow its reach through new opportunities and partnerships. We also looked back on PLT’s accomplishments from the past year and took a peek at what’s to come in the year ahead. Seventeen Concurrent and 10 Show and Tell sessions provided opportunities for members of the PLT Network to learn from each other to enhance their state programs. Our new Leadership in Education Awards allowed us to recognize five individuals and organizations who make significant contributions to their state programs. We honored two outstanding PLT Coordinators, Misty Bowie and Betsy Ukeritis, with Gold Stars. We enjoyed a chuck wagon dinner at the local Cody Cattle Company – ending with Louisianna’s Ricky Kilpatrick joining the band for “Wild Thing” – and don’t forget the backup dancers! During our tour of Yellowstone National Park, we witnessed regeneration following forest fires, experienced the power of geysers, and reveled in abundant wildlife! I encourage you to read Vanessa’s wonderful blog on the conference, as it features many more highlights and several photos that capture the energy of this terrific event. You can find it on plt.org under News & Stories > News. 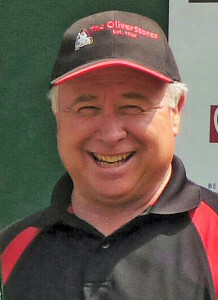 Pat Sirois, Maine SIC coordinator. The Maine committee continued to grow in 2017. 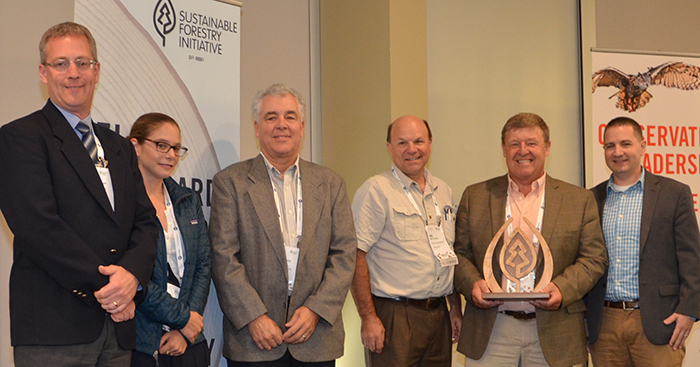 Conservation Forestry joined SFI with its 359,000 acres managed by Huber Resources. Prentiss and Carlisle also brought their 748,000 acres into the SFI Program. SFI’s expanded footprint is also good news for outdoor enthusiasts — 98 percent of 285 million acres/115 million hectares is available for outdoor recreation. SIC Outreach Team Aug. 30: Front row, from left, John Starrett, Tim Richards; Middle row, Kevin Doran, Jack Witham, Scott Pease, Pat Sirois; Back row, Kevin McCarthy and Gordon Gamble. Squeezing in the outhouse Aug. 30, from left: Jack Witham, Al Cowperthwaite, Pat Sirois, Scott Pease and John Starrett. 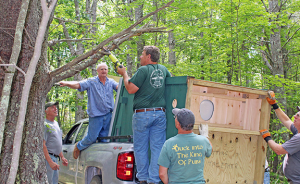 Al Cowperthwaite, director of North Maine Woods, drove four hours on August 30 to bring a high-quality outhouse to the site. He then had the skill to back his truck and the outhouse down a very narrow road – more like a path really – into the woods behind the worksite. He got plenty of good-natured advice from his fellow volunteers along the way. McCarthy is a member of the Outreach Committee of the SFI Implementation Committee (SIC), and also president of the TREE Foundation Board. He and the rest of the crew worked hard, but also enjoyed the collaboration with old and new friends. The first day of work was June 23, said Mike St. Peter, executive director of Certified Logging Professionals, who came from Jackman to help. CLP Board members brought their equipment and UMaine students also pitched in to clear trees from the site of the outdoor classroom, access road and off-road parking area. 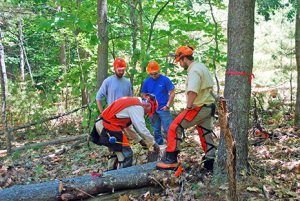 UMaine students learning on the job June 23: CLP instructor John Cullen measures tree hinge length with UMaine students (L to R) Ethan Hill, Ryan Karroll, and Todd Douglass. For more than three decades, scientists from the University of Maine have been studying the tract of oak-pine forest, which was offered to the university for research by William and Winifred Holt. Their family endowed the Holt Woodland Research Foundation and donated funds to the university for its long-term forest ecosystem study until 2014, when the foundation merged with the Maine TREE Foundation. The 100-acre study area, dominated by oak and pine, is within a tract of nearly 300 acres. Wetlands, primarily salt marsh, make up an additional 50 acres, Witham said. The property is bordered by the Back River, an estuarine branch of the Kennebec River, on the east. Sewell Pond, the only Great Pond on Arrowsic Island, and Route 127 form the western boundary. The property is bisected by Old Stage Road with the eastern portion as the principal land base used for research. See A Long-Term Study of an Oak Pine Forest Ecosystem: A Brief Overview of the Holt Research Forest. Sirois also had a special interest in the project because he worked on the research forest at the beginning. The forest research plan emphasized two major goals, Witham said, to monitor long-term changes in the forest’s plant and animal populations and to document the effect of forest management on these populations. 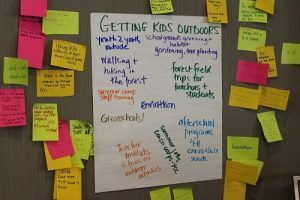 Many groups have visited the research forest for educational programs, including landowners, natural resource professionals, foresters, loggers, and wildlife people, but the outdoor classroom will expand educational outreach. 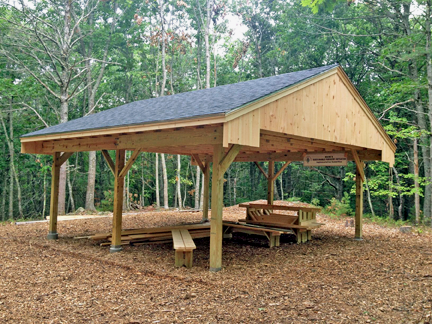 McCarthy, who was working on Sept. 2, when the outdoor classroom was completed, is excited about the new opportunities for teaching children and adults about Maine’s forests. Mike St. Peter, Erik Carlson and Steve Laweryson. UMaine students Ethan Hill, Ryan Karroll, and Todd Douglass helped with the clearing as did Clarke Cooper, a UMaine employee at the Holt Forest for the summer. Materials for the Outdoor Classroom Pavilion were donated by Hancock Lumber, Huber Engineered Woods, Viking Lumber and Mainely Trusses. Support also was received from Maine Forest Service Project Canopy, the Maine Timberlands Charitable Trust, the Elmina Sewall Foundation and the Morton-Kelly Charitable Trust. Robbins Construction of Arrowsic loaned the staging that made the job much easier. The hard-working SIC Outreach Team on Aug. 30: Front row, from left, John Starrett, Tim Richards; Middle row, Kevin Doran, Jack Witham, Scott Pease, Pat Sirois; Back row, Kevin McCarthy and Gordon Gamble. “We cut this wood lot for the research project,” Sirois said. “We harvested 50 acres out of the 100 acre research area. There were 2 ½ acre lots organized like a checkerboard and they randomly selected the blocks that they wanted to harvest versus the ones that were the controls. So for me it was fun to come back.” Read more. Pat Sirois invited me to attend a SFI meeting to share information about Pine Tree Camp, a summer camp for Maine children and adults with disabilities located on 285-acres in Rome. Just 20 minutes from the Maine Forest Products Council office, Pine Tree Camp transforms the lives of more than 600 Mainers each summer (watch video above). During their stay, their families benefit from a six-day respite. Often it is the only break they receive all year long. The focus of my visit to SFI was to share Pine Tree Camp vision for the future and explore how the organization might be able to get involved. I shared with the group that there were opportunities for donation of materials to benefit the construction. Pine Tree Camp’s facility is aging and its buildings, many dating back to the 1950s, are poorly ventilated and lack the accessibility that our campers require. At the same time, our campers’ needs are increasing making our hot stuffy buildings not only uncomfortable but dangerous. In 2009, Pine Tree Camp embarked on a mission to transform its campus. A number of critical projects have been completed, in fact the project is nearly complete. In July 2014, Pine Tree Camp officially opened the first of five new camper cabins. Two more are being constructed now. The feedback from SFI members has been incredible. In fact, following the meeting both Huber Engineered Woods and Seven Islands made substantial generous donation of materials necessary for our projects. 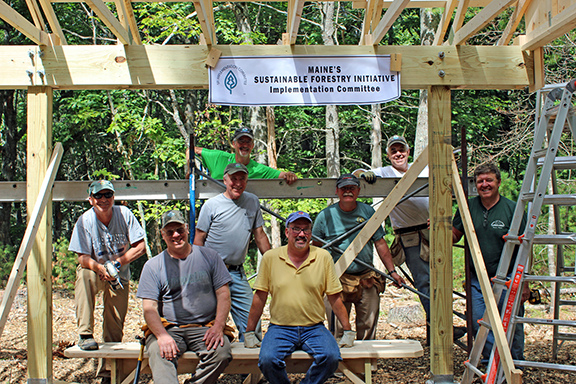 We invite SFI and Maine Forest Products Council members to join Huber and Seven Islands in support of Pine Tree Camp with a goal of having a cabin named for the organization. Please feel free to contact me or Pat Sirois for more information. Thank you! “It was beyond my wildest,” said Morrison, who joined the Maine forest Products Council board this fall. “I’m really pleased to win this and I hope to put it to use somewhere in this great state of Maine. 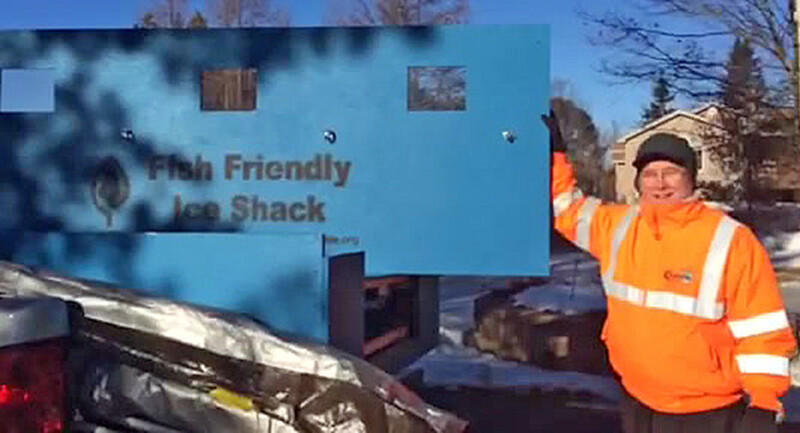 Morrison, who is general sales manager of Anderson Equipment in Farmington, won the “Fish Friendly” ice shack (valued at $2,000) in a raffle sponsored by the Maine Snowmobile Association (MSA), in partnership with Sustainable Forestry Initiative (SFI), which supports the efforts of Maine’s Fisheries Improvement Network (FIN). Irving Woodlands, Huber Engineered Woods, Plum Creek and Hancock Lumber donated SFI-certified materials for the ice shack and to Hancock Lumber, Sappi Fine Paper and Wagner Forest Management for helping with the construction. To find out more about FIN, visit www.sfimaine.org, or contact Pat Sirois, SFI coordinator, 207-622-9288.